You don’t have to sacrifice autonomy, dignity, or choice in a Green House. Based on Dr. Bill Thomas’ Green House model, these elder care facilities offer private living spaces, easy access to the outdoors, and a warm, inviting interior. Asbury Park is a Green House residential community that is designed to de-institutionalize long-term care by facilitating human relationships in order to preserve quality of life. It’s a place where elders can receive assistance and support with activities and clinical care without the assistance becoming the focus of their lives. 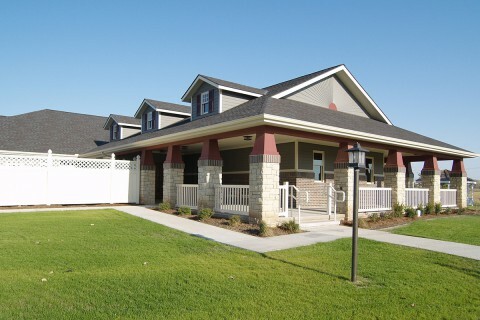 Located in Newton, Kansas, these homes are on the cutting edge of a trend to provide comfortable, home-like environments for our elders. For the Asbury Park Green House Homes, Health Facilities Group helped the campus develop four 10-bed, freestanding Green House nursing units based on Dr. Bill Thomas’ Green House model. The Green House Project defines its trademark as a certification that “homes meet and maintain key standards, including small size, home layout, advanced staff training and a low staff ratio.” In designing for this model, HFG delivered units that balance intimacy and community in order to recreate the comfort of home. Health Facilities Group serves medical professionals and patients alike by meeting the highest standards of technical and aesthetic design. Our mission is to create nurturing environments that foster healing and empower the spirit. At HFG, healthcare architecture is our specialty, our passion, our reason to design.